This website is provided by Monroe Engineering including Monroe Aerospace, LLC and all of its affiliated entities (hereinafter “Monroe Aerospace”) as an on-line information and communication service. Use of this website is subject to your acceptance of the terms and conditions set forth within this agreement (hereinafter “Agreement”). By accessing or using this website, you agree that you have read, understood, and have become legally bound by the following terms and conditions. If you do not wish to be legally bound by these terms and conditions, you may not access this website or use any of the services provided on or through it. Your use of this website shall be deemed as your acceptance of this Agreement. Monroe Aerospace may modify this Agreement at any time without prior notice. Modifications are effective immediately upon posting of the modified Agreement. You agree to review this Agreement periodically to be aware of any modifications. Your continued use of this website shall be deemed as your acceptance of any and all modifications of the Agreement. You agree NOT to use this website or any of this website’s services for or in connection with any of the following activities: (1) tampering, hacking, modifying, or otherwise corrupting the security or functionality of the services, interfering with or disrupting Monroe Aerospace’ network or other networks connected to the service, or posting, e-mailing, or otherwise transmitting any data that contains any software viruses, Trojan horses and/or any other code, files, or programs intended to destroy, disrupt, or otherwise impair a computer’s functionality or the operation of any service; (2) chain letters, pyramid schemes, or spamming; (3) posting, e-mailing, or otherwise transmitting any unlawful, harmful, harassing, defamatory, libelous, abusive, threatening, vulgar, sexually explicit, hateful, or otherwise objectionable material of any kind, or any material that is invasive of another’s privacy or exploits children under 18 years of age; (4) spoofing or otherwise impersonating any person or entity, such as another user or any Monroe Aerospace personnel, falsely stating or otherwise misrepresenting your identity or affiliation, or forgoing any TCP/IP packet header or any part of the header information in any e-mail or other posting; (5) using the services for any fraudulent or illegal purpose, or gathering personally identifiable information without prior consent; (6) violating any applicable local, state, national, or international law, such as laws governing financial services or export control; (7) interfering with another user’s enjoyment of the services; or (8) violating any other of Monroe Aerospace’ rules or policies. User names and passwords are issued at Monroe Aerospace’ discretion upon request. A username and password may not be used by anyone but the buyer/user to whom it was originally issued. You agree that you will not give out or share your username and password with anyone, especially people outside of your company, or use the username or password of any other user. Your use of this website is nonexclusive, non-transferable, and limited to right to access, display, download, and print material from this website solely for you and your companies non-competitive use. Information obtained by you through this website may not be shared or given to any third party—doing so constitutes a violation of this Agreement. You may not modify, reproduce, publicly display, distribute, extract, collect, harvest, or otherwise modify materials from this website for any competitive commercial purposes. You may use this data in your computer systems as vendor quote information as long as it is associated only with Monroe Aerospace and its affiliates as deemed above. All data on this website is the property of Monroe Aerospace and can only be used as set forth herein. Monroe Aerospace reserves the right to seek damages to the full extent permitted by law for any violations of use of the Monroe Aerospace website as set forth within this Agreement. All material contained within this website is copyrighted. You agree to comply with all copyright law when you access or use this website. The trademarks, logos, and service marks (hereinafter “Marks”) displayed on this website are the property of Monroe Aerospace or other third parties. You are not permitted to use these Marks without prior written consent of Monroe Aerospace or such third party, which may own the Marks. The catalog portion of our website is formatted in Adobe Acrobat. Permission is granted to download the Adobe Acrobat portion of our catalog onto your desktop for reference only and for the purchase of our products. Any reproduction of the contents of our catalog for purpose of the sale of any information is prohibited and infringement of copyright laws. While every effort will be made to maintain listed prices, prices are subject to change without notice due to changes in cost of material and/or manufacturing services. Prices and availability contained herein are quotations and DO NOT constitutes legally binding offers. Prices are quoted and payable in U.S. Dollars. Buyer will arrange for and pay all expenses necessary to deliver purchased parts from Monroe Aerospace' facility, unless specific arrangements are made prior to sale. All items priced on this website should be considered stock unless buyer is notified prior to shipment. Pricing is updated daily to reflect fluctuations in manufacturer's pricing. Monroe Aerospace reserves the right to correct pricing in the event of our error and will notify the buyer prior to shipment to obtain both acknowledgement and acceptance of correction. Buyer's order is subject to Seller's line item requirements AND minimum order requirements. Monroe Aerospace and its officers, directors, employees, and agents, shall in no event be liable to any person or entity for any indirect, special, consequential, or other damages that are related to the use of, or the inability to use this website, or the content or functions contained therein. We typically ship orders either by UPS or FedEx. Next Day Air Delivery is available at an additional cost. Every effort is made to ship your entire order to you on the day it was ordered. When an order is received after 12:00 PM EST, it is not always possible to ship the entire order that day. In some cases, we will ship whatever we have completed to you on one day, and the balance the next business day. In doing so, you receive product as soon as possible. Monroe Aerospace operates a Distribution Center in Melbourne, Florida. Your order will ship from the Distribution Center closest to you unless we are out-of-stock of that item(s). If we are, we will send them from the other distribution center. Note: we carry the most common items in both locations to offer you the most timely delivery. Most of the country will receive their order in 2-3 Day via UPS or FedEx Delivery. Orders of $150 or more ordered at one time, in continental US, under 40 pounds and shipped to a single location will be shipped free. If your order is below $150, the shipping cost will be added to your invoice. We are a stocking distributor and maintain an extensive amount of inventory. We have an order fill rate close to 100%. In the case we do not have a sku in stock we will contact you. While we maintain a high level of accuracy, mistakes will occur from time to time. Simply contact us and inform us of the error. We will either issue a credit memo OR make other arrangements. We are not respondsible for shipping errors caused by UPS/FEDEX either via shipping or shipping calculations based off of integrations of their software. This Agreement shall be deemed to have been made in the State of Florida, U.S.A. and shall be interpreted in accordance with the law of the State of Florida without regard to conflict of law principles. You consent to the exclusive jurisdiction of the state and federal courts of the state of Florida, U.S.A., for determination of any claim or controversy between the parties and arising out of or relating to this Agreement. You consent to the jurisdiction of Florida courts and waive any objections as to personal jurisdiction or to the laying of venue in such courts due to inconvenient forum or for any other basis. In the event that Monroe Aerospace shall engage an attorney or commence an action against you arising out of facts and circumstances related to this Agreement including, but not limited to, your breach of any of your obligations hereunder, Monroe Aerospace shall be entitled to recover its reasonable attorney's fees, costs, and other disbursements incurred in connection therewith. You agree to indemnify, defend, and hold harmless Monroe Aerospace, its officers, directors, employees, agents, licensors, suppliers, and any third party information providers to this website from and against all losses, expenses, damages, and costs, including reasonable attorney’s fees, resulting from or relating to any violation of this Agreement by you. This website is controlled and operated by Monroe Aerospace from its offices within the United States. Monroe Aerospace makes no representation that the products or other material accessed through this website are appropriate or available for use in all other locations, and access to them from other countries, where their contents are illegal, is prohibited. Those who choose to access this website from other locations do so on their own volition and are responsible for compliance with applicable local laws. You may not export or re-export any product received under this Agreement except in full compliance with all United States laws and regulations. In particular, the products may not be exported or re-exported into, (or to a national or resident of any country to which the United States embargoes goods, or to anyone on the U.S. Treasury Department’s list of Specially Designated Nationals or the U.S. Commerce Department’s Table of Denial Orders). In addition, you are responsible for complying with any local laws in your country, which may impact your right to import, export, or use this website or products obtained through this website. You agree to obtain prior written permission from Monroe Aerospace before linking to this website. This website provides links to third party websites or Internet sources, which are not under the control of Monroe Aerospace. These links are provided solely for informational purposes and as a convenience and do not constitute an endorsement, sponsorship, recommendation, or referral by Monroe Aerospace to the linked website or its products and services. Monroe Aerospace makes no guarantees whatsoever about any other website to which you may have access through this website. Monroe Aerospace is not responsible for actions of the operators of linked websites or the content, services, or products available on or through them. Any attempt by any person to deliberately damage this website or undermine its operation is a violation of criminal and civil laws. Should such an attempt be made, Monroe Aerospace reserves the right to seek damages from such person to the full extent permitted by law. Monroe Aerospace reserves the right to terminate service to you in its sole discretion, with or without notice, if we believe that your conduct fails to conform with this Agreement, to investigate and to involve and cooperate with law enforcement authorities, and to pursue a civil lawsuit or criminal prosecution for any alleged or actual illegal activities involving this website or any of the services. Obligations assumed by you through this Agreement, shall survive termination. Monroe Aerospace may terminate, change, suspend, or discontinue any aspect of this website at any time, including the availability of any features of this website. Monroe Aerospace may also impose limits on certain features and services or restrict access to parts, or all, of this website without notice or liability. The following terms of sale apply to any sale of products by Monroe Aerospace, LLC. – a Florida corporation, with the place of business at 399 East Drive Melbourne, Florida 32904. Monroe Aerospace will ship same day on all priority orders (UPS Red, Blue, & Orange – FedEx P1, P2, and Economy) that are received by 3:45pm EST. If you are in an AOG situation or your order MUST ship Same Day Service, call your Account Executive at 1.800.330.3975 to verify the status of your orders’ shipment. Ground orders shipping to locations in Florida will ship the same day if received by 3:45pm EST. Ground orders shipping out of the state of Florida will ship same day IF the order(s) are received by 1:45pm EST. DHL orders must be received by 2:45pm EST to receive Same Day Shipping. Orders shipping via USPS will ship the following business day. Buyer is obligated to inspect parts after deliver, within a reasonable period of time, not to exceed 30 days. Parts will be presumed accepted unless Monroe Aerospace is notified of an error, defect or rejection within the 30 days period. Monroe Aerospace will have reasonable opportunity to replace rejected parts or credit buyer with the purchase price. Monroe Aerospace makes every effort to update all pricing. Monroe Aerospace reserves the right to correct pricing, if necessary, after an order has been submitted and prior to shipment. Buyer will be notified prior to processing the order if a correction is necessary. Monroe Aerospace reserves the right to replace ordered parts with a new revision, superseding parts or replacement part with the same fit, form and function, conforming to establish industry specification where the drawing or specification authorizes such replacement. Buyer’s part number will be referenced when necessary with purchase orders. Our site may contain typographical errors and inaccuracies. We reserve the right to correct ANY error and disclaim ANY liability for damages resulting from the use of any site content. We encourage all buyers to use their own governmental prints and proprietary prints to insure accuracy. 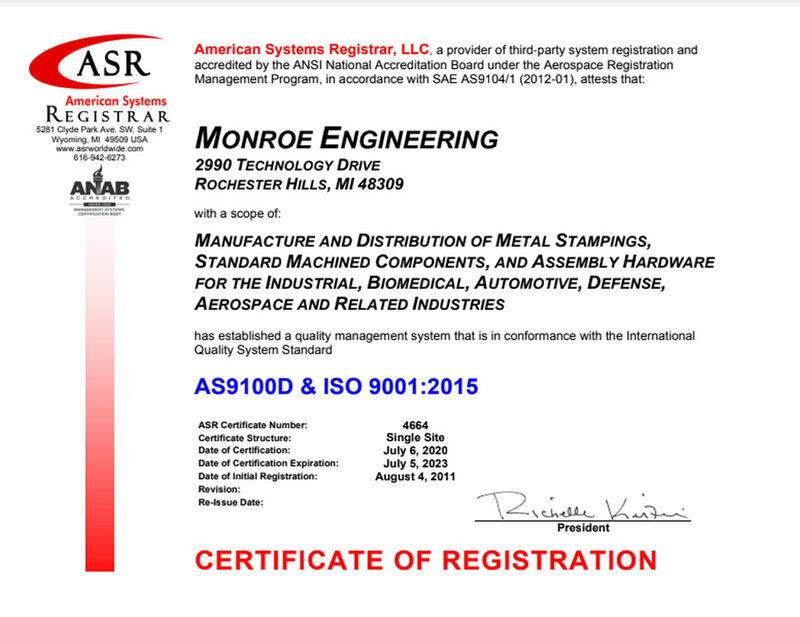 Monroe Aerospace’ Catalog is an industry leader and we welcome our customers to notify us if they detect any inaccuracies. Manufacturer’s Certification is available on all Mil-Spec and Aerospace parts. All items are in conformity with all current governmental requirements and the specifications of the respective manufacturers. Monroe Aerospace disclaims all other warranties, express or implied, including all warranties of merchantability and of fitness for a particular purpose. The liability of Monroe Aerospace is expressly limited exclusively to replacement of any item which is rejected because of a defect in material or workmanship. Such replacement shall constitute satisfaction of all liability Monroe Aerospace, LLC may have in connection with such parts whether liability is based upon contract rights, negligence, both direct or indirect, consequential damages. All major credit cards are accepted. C.O.D. and bank draft are also alternative methods of payment. Customers that have been approved with a line of credit (Net 30) by Monroe Aerospace, will pay Monroe Aerospace within 30 days of invoice date subject to meeting Monroe Aerospace’ credit requirements. In the event an account goes into collections, buyer will be responsible for any and all collection and/or legal fees to collect the outstanding balance.